Decaying Logic is known for bringing us the first jigsaw game on Steam and then following it up with the first jigsaw game where you could get killed by zombies. For their third jigsaw title they have gone for a full blown sequel, so this time it is more than just the theme that got an overhaul. The game is a return to the traditional jigsaw style puzzles, so there is no reason to check over your shoulder for the undead, and it is all themed around birds. Although you don’t have to be a fan of our avian friends to enjoy this game, it certainly helps as they dominate every single puzzle. The big question, of course is what warrants that “2” in the title. For one thing, the game engine has received a bit of an overhaul, so if you spent a lot of time with the previous titles you’ll immediately feel the difference. Puzzles pieces still float in water, but instead of being restricted to the top and right corners of the screen they are now all around the board. Of course, this means that the board is now a little smaller, but to combat this you can use the new “zoom” feature to get a closer look. You are going to need it too as the twenty five puzzles on offer range from sixty pieces to a whopping 350 pieces. This might not sound as impressive as the 1000+ piece physical puzzles, but it is another thing altogether in digital format. The bird photos, taken in the South Atlantic, make for tricky puzzles as you are mostly dealing with pieces that show sea, sand, rocks or feathers. To make things a little bit more challenging the puzzle pieces are also irregularly shaped and cut in styles that you won’t see with physical pieces. This is nothing new for fans of the previous two Pixel Puzzles titles, but what is new is that pieces can now be rotated. Like in the previous titles the pieces automatically snap into place when dropped in close proximity to their correct location. However, the rotating element increases the challenge significantly and brings the game more in line with a real physical puzzle. Not only does this game have more puzzles than the previous titles, but puzzles are now saved individually as well, which is something that is sure to please fans. You no longer have to complete each puzzle in one sitting as everything is saved when you quit. Pixel Puzzles 2: Birds contains a couple of other additions to make life a little easier. People who like to sort their pieces first will appreciate the new “bottom tray” feature. At the tap of a button you can open the tray and place pieces that you are not ready to put on the board yet, but don’t want floating around. In previous titles these pieces had to be placed on the board, which meant things got cluttered very quickly. You can shuffle submerged pieces at the touch of a button and change the table background color to ensure that it contrasts well with the puzzle picture. The only problem is that the buttons to activate these are in the water with the puzzle pieces instead of tucked away in a menu. It is a minor complaint, but something that could have been avoided by making it possible to hide these controls. Another new addition that players will spot immediately is the cage on the right corner of the screen. While playing, small crabs randomly scuttle out from underneath pieces and you can toss them into the cage after grabbing them. The crabs serve as power-ups and you have three different options available to you depending on how many of them you have in the cage. Five crabs grant you the ability to briefly view a ghost image of the completed puzzle picture while ten crabs enables you to automatically rotate a selected piece into the correct orientation. Finally, for twenty crabs you can see the exact location on the board for a selected piece. These abilities all come in very handy, but the crabs as cute as they are, can become a bit obtrusive because they are all over the place. The visuals are clean and functional, but aren’t exactly mind-blowing, which is fine for a casual game. Your only options are playing the game in full screen, enabling Vsync and turning on the “HD” mode. The advantage to keeping everything simple is that this game will run on just about any system. I don’t know my sturnella loyca from my straited caracara, but could definitely appreciate the bird photos taken by Dave Reynolds. The game includes a gallery option for checking out the photos, but there is no way to view them in high definition unfortunately. Decaying Logic once again included a bonus mini-game, but this time it is a simple bird-shaped puzzle. The opening interface, which is set up like an old television with each “channel” displaying information about previous Decaying Logic titles is also a neat touch. Just like the overall feel of the game, the audio is also quite tranquil. Completing the puzzles require concentration, so the soothing background sounds of lapping waves and birds fit the theme rather nicely and never becomes obtrusive. The controls are very straightforward, left-click a puzzle piece to pick it up and then move it into position or right-click to rotate. Everything else is handled by hot-keys. New puzzles are unlocked by completing old ones and you usually open up one or two of different sizes at a time to keep things interesting. The 26 Steam achievements in the game are also all tied to the completion of the puzzles. Previously completed puzzles stay completed, but you can also delete all your save data from the options menu if you want a fresh start. Pixel Puzzles 2: Birds definitely delivers on its promise of being smoother and more refined than its predecessors. The game features tons of improvements over the original titles and is a very enjoyable game in its own right. The bird theme is an interesting choice, but makes for some very challenging puzzles. 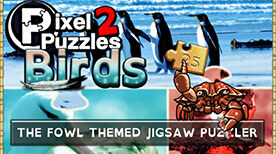 If you enjoy jigsaw puzzle games you really can’t go wrong with Pixel Puzzles 2: Birds.